Convoy Global Holdings will invest £15 million (US$19.29 million) for a significant stake in British virtual bank Tandem Bank, as it seeks to apply for a virtual bank licence from the Hong Kong Monetary Authority, according to a stock exchange filing on Tuesday. Under the agreement, subsidiary Convoy Technologies will buy an undisclosed stake in Tandem Money, which is the holding company of Tandem Bank. The deal would be completed on December 7, the stock exchange filing said. Convoy will become a key, non-controlling shareholder of Tandem. This marks the first major investment by Convoy since the Independent Commission Against Corruption and the Securities and Futures Commission arrested its former chairman Quincy Wong Lee-man and three former executives in December. Convoy’s shares have been suspended from trading since December, but it continues its operation as a financial consultant for insurance and pension products, and has submitted an application to the HKMA for a virtual bank licence. Last year the company, which was the largest independent adviser in Hong Kong with more than 100,000 customers,appointed new board members and management under chairman Johnny Chen Chi-wang. “We believe the investment from Convoy, which will be a significant shareholder at Tandem, will help our company to expand in Asia,” said Ricky Knox, founder and chief executive of Tandem in an exclusive interview with the South China Morning Post on Tuesday. 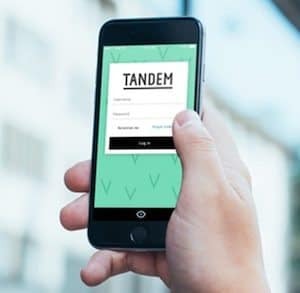 Founded in 2013 by Knox and Matt Cooper, Tandem is one of the most established virtual banks in the UK operating with a full bank license under the supervision of Prudential Regulation Authority (PRA). Tandem Bank currently serves over 500,000 customers via their smartphones. Its digital platform – backed by use of big data and AI-driven technology – allows customers mobile phone access to a full range of retail banking services including deposits, mortgages, loans and credit cards. Convoy president and executive director Ng Wing-fai said the company would allocate HK$500 million (US$63.84 million) as working capital for the virtual bank should it receive approval from the HKMA. “We would target to offer the virtual banking services to Asian customers including those in Indonesia, Malaysia, Philippines and others,” Ng said. Without any experience in operating a bank, Convoy would have difficulty securing a licence from the HKMA, said Gordon Tsui Luen-on, managing director of financial advisory firm Hantec Pacific. “It makes sense for Convoy to team up with a virtual bank in UK to apply the virtual bank licence in Hong Kong as the UK partner can bring technology and experience to it,” Tsui said.